Anupma Khanna is an internationally awarded journalist, speaker and soft skills & behavioural trainer. She is currently a Senior Feature Writer with The Pioneer newspaper where she also heads special pages on lifestyle, art, culture, sports, governance, development and social issues. Driven by responsible public-interest journalism she has over 700 published news stories that have shaped public opinion, influenced policy makers and resulted in positive change. Anupma is the first journalist from Uttarakhand to win the prestigious Jefferson Fellowship at the East West Center, Hawaii, United States of America in 2014 where she was the only journalist from India. While in the U.S, she was also honoured with the 2014 Mary Morgan Hewett Award, U.S.A, an award given to one female journalist from Asia- Pacific and the U.S.A once in two years. Anupma is the second Indian to win this prestigious award. Invited as a Speaker at the 2014 International Media Conference, Myanmar- the world’s biggest international journalism conference, she addressed a gathering of over 300 journalists from 31 countries on 'Challenges of a Free Press'. Anupma's other professional recognition includes 'The Pride of Doon Award', an award for excellence in journalism by the Governor of Uttarakhand in 2013 and with 'Stree Shakti Samman' in 2011. She is a co-author of 'Crucible & Cauldron' and writes extensively as a guest writer for popular publications on a wide variety of subjects. Her journalistic portfolio is diverse and she has keen interest in covering development issues like health, education, governance, social welfare, law & police, gender issues as well as exploratory features on breaking news, environment, art, culture and unique human-interest stories. 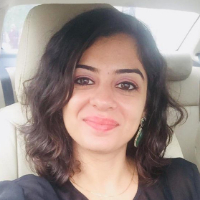 Having a penchant for learning, Anupma has done BA (Honours) in Journalism from DCAC, University of Delhi (she was a college topper), PGDBA from Lal Bahadur Shastri Institute of Management, New Delhi and LLB (HNB Garhwal University). Helping others makes Anupma happy and in addition to her role as a journalist she has positively influenced over 3000 individual lives through her trainings. Besides writing she loves adventure sports, travel, photography, music and books. Journalism is all about gathering and broadcasting the News. "After finishing my school I went to Delhi to pursue my B A in Journalism (H) from Delhi University and I topped in the college. Following that I also have a degree in management and law. After that I came back to Dehradun and joined core team of journalism in Dehradun. I have been doing journalism since 2008, specialized in print media."